That's how he rolls: Adam Pomerantz gets ready to make another bagel in the kitchen of Murray's Bagels. Could there be anything worse for a New Yorker than sleeping in on a lazy weekend, then finally venturing out into a neighborhood without bagels? It got so bad for Adam Pomerantz that he left his sweet gig as a Merrill Lynch vice president and put his money where his mouth is. "My brother and I lived in Greenwich Village, and we'd get up every Saturday and Sunday morning and there were no places to get a bagel back then," Pomerantz said of his mid-1990s decision to leave mortgage trading. "We knew there had to be a great demand for bagels just in our neighborhood." So Pomerantz tapped into his savings, got some loans and opened Murray's Bagels, still serving in the Village and in Chelsea 13 years later, and one of the contestants in this month's NBCNewYork.com Golden Local debate. 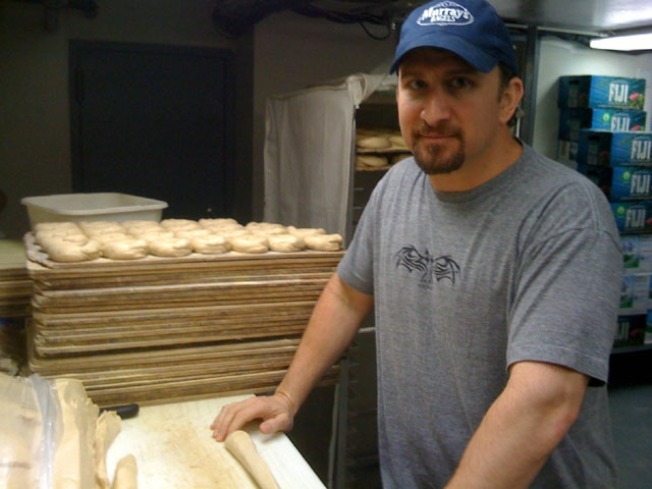 "I grew up in a real New York Jewish family, and we have a passion for bagels," he said. "We know our smoked fish and we know about bagels. It was kind of our soul food." Pomerantz knew his job was a good one, but also knew that as he approached 30 and still had some scheduling flexibility, the time was right to get out of the mortgage racket. "I wasn't cut out for the whole suit-and-tie business," he said. "I left at the perfect time. Financially, it was the time to take that risk. And I knew that if I didn't do it then, I'd never do it." And that schedule flexibility turned out to be critical when he and his brother set out to get into the bagel business. As he met with the man who would sell him his kitchen equipment, he asked the guy if he knew of any good bagel rollers who could school him. "Within 10 minutes I had this guy calling me back, telling me to meet him at 11," Pomerantz recalled with a laugh. "I said, 'OK, see you tomorrow morning.' And the guy said, 'No, 11 o'clock tonight.'" 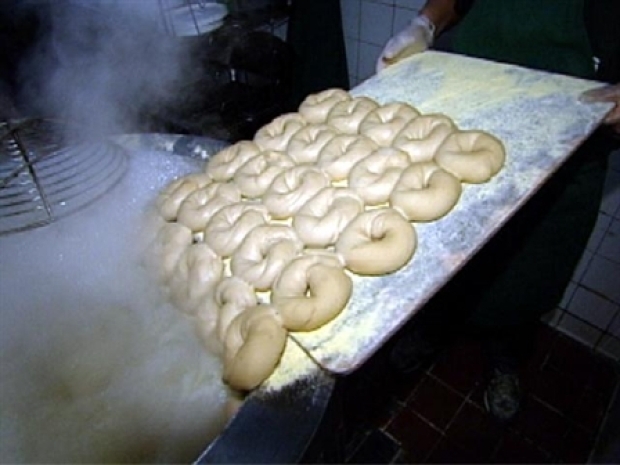 Two weeks of rolling bagels through the graveyard shift were enough to point Pomerantz on his way. "I got the feel for how to make a great bagel," he said. "It was great hands-on experience." And while Pomerantz prefers a poppy bagel with "a little Nova and a schmear of cream cheese," he said he also likes the heartier editions stacked with meat that are so popular at Murray's. "We sell hundreds of them every day," he said. We won't argue with his sales estimates, but let's see how things play out in the debate. Cast your vote and weigh in with comments before Wednesday morning at 6 a.m.